Atlantic City is home to world-class entertainment and nightlife. 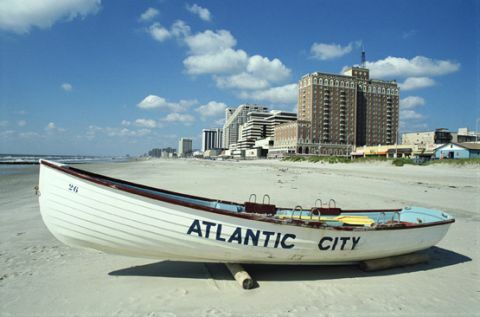 From the late 1800's through the 1940's, Atlantic City was a bustling tourist destination. The city faced a drop in popularity following World War II, and today much of its appeal centers around the casinos that dominate its waterfront. Besides gambling, tourists visit Atlantic City's casinos for the luxurious spas, top-name concerts, shopping, and fine dining. Outdoors, the historic boardwalk offers views of the beautiful shoreline while connecting many of the area's best attractions. The ocean offers water sports and fishing, while the area's golf courses are rated among the best in the Northeast. • New Jersey - Find travel information, maps, tourist resources, and more photos of New Jersey. • City of Atlantic City - Welcome to the official web site for the City of Atlantic City, New Jersey. • Atlantic City Tourism - Visit this official Atlantic City, New Jersey travel guide. • Atlantic City Guide - Business directory and maps of Atlantic City, New Jersey.